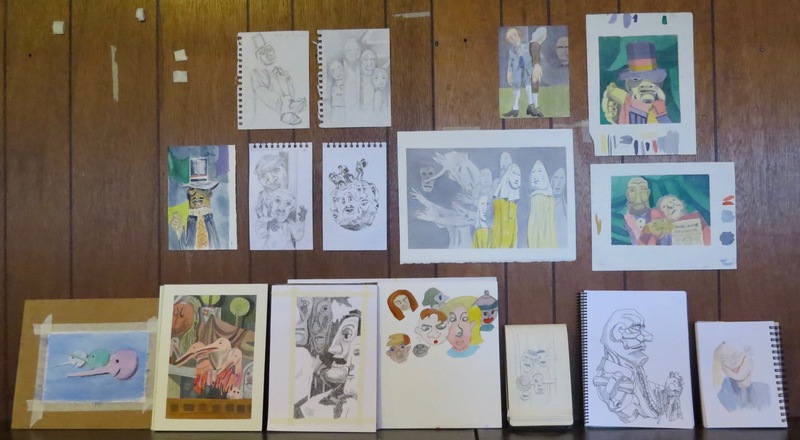 Spring term has begun at the Dundas Valley School of Art. 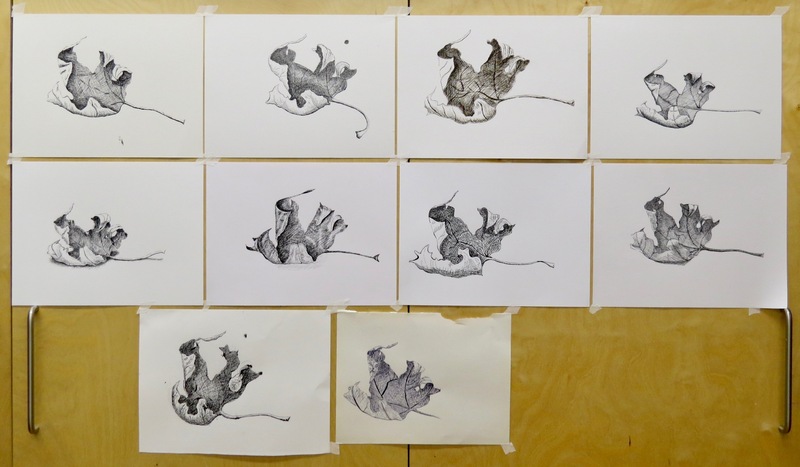 Yesterday, I was back in Studio 2 with an enthusiastic group of art students and our day was spent on pen and ink basics. 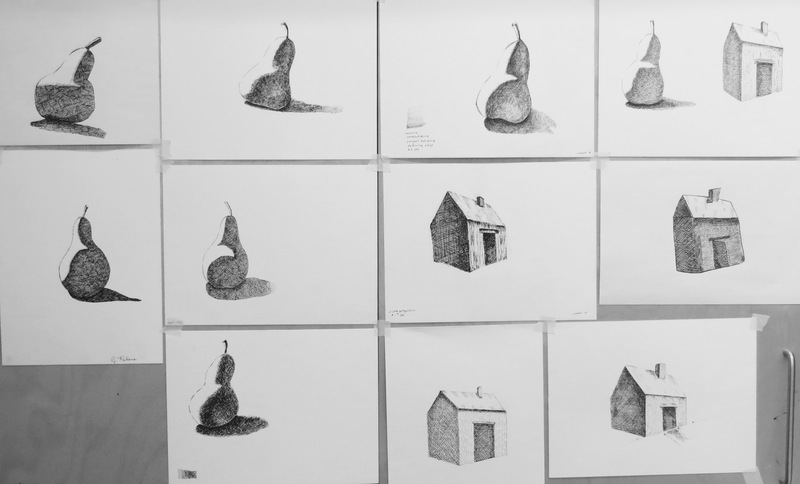 We discussed the fundamental techniques such as hatching, cross-hatching, stippling and line weight. It’s not all technique when I teach, however! Technique without sound drawing fundamentals (light and shadow, a little bit of perspective, historical context, etc.) can result in a superficial learning experience. Mind you, it made for an intense and busy day. The group completed three step-by-step exercises. For the first two, we worked from a diagram that I presented at the easel. This is the model for our second drawing. But let’s get back to the beginning. Working from a diagram, we drew a pear. The technique we employed was cross-hatching and, in particular, a ‘parquet’ approach. This approach eliminates some baffling concerns. Which direction should the pen strokes take? The ‘parquet’ process begins with a very mechanical application. Careful attention is paid to a light source and the interlocking shapes of light and shadow. By the way, all of our drawings were started first with pencil. The drawing is developed gradually with middle tones and darks. Edges are thoughtfully considered. Outlining is scrupulously avoided! Bit by bit, our flat shapes take on a more three-dimensional fullness. Our next drawing was of a simple structure. I touched on only a few perspective basics. It was a pen and ink workshop, after all, and perspective lessons require time and a very well thought out presentation. We hatched our first values before cross-hatching. Again, the middle tones and darks were added gradually. Let’s have a look at the first two student drawings. If you click on a critique image, you’ll see a larger version. There was time for one more drawing. I’d brought in copies of a black and white photograph that I’d prepared for the students. I did my pencil drawing while they finished up their first two exercises. Then, all gathered around for my pen and ink demonstration. I worked very quickly, taking about fifteen minutes, and reviewed many of the ideas we’d discussed over the course of the day. The group didn’t have very much time to complete the final exercise but still managed to do quite well. It was a fine, full day in the studio. I’ll be teaching an Introduction to Drawing Birds with Pen and Watercolour workshop on Thursday, May 3 at DVSA. Why don’t you join us? 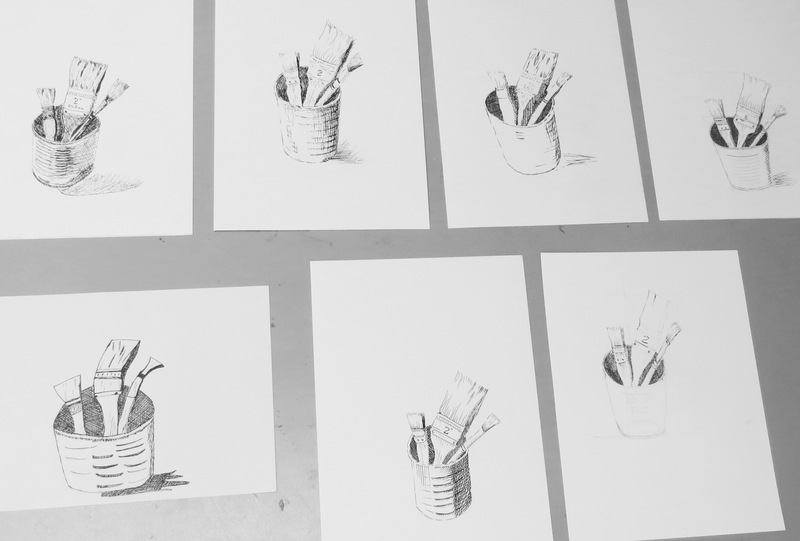 Before I sign off, here are the brush and pail drawings. Van Gogh and the Reed Pen at DVSA! Several years ago, I purchased a wonderful book of the drawings of Vincent Van Gogh. It’s a real doorstop and was published by the Metropolitan Museum of Art in New York City. I was particularly attracted to the reed pen drawings. Reeds, like quills, go back a long way as drawing instruments. Why did Vincent use them? The fluidity and expressive marks can’t be matched by steel nibs. Vincent was also broke most of the time and likely made his own pens. 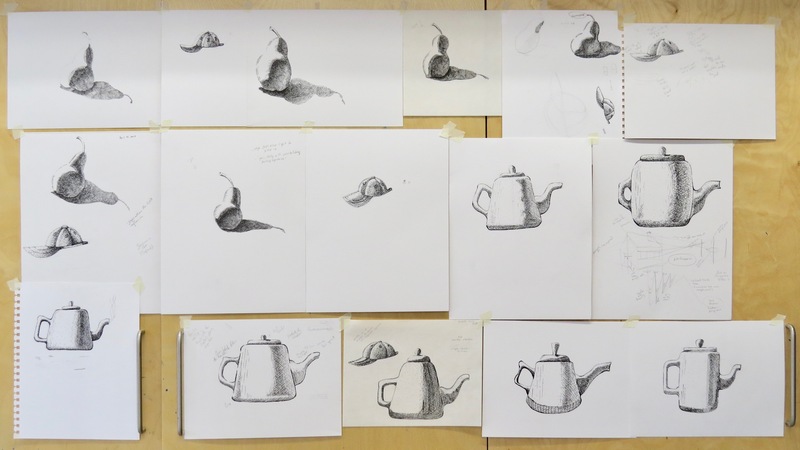 Yesterday, I presented a one-day workshop at the Dundas Valley School of Art. I had harvested reeds from phragmites at a local wetland. The students just needed to bring their ink and paper. I had cut enough pens for everyone ahead of time. Naturally, the students wanted the experience of cutting their own so I demonstrated and assisted with the process. Everyone made a successful pen and got through the entire day with very little maintenance. We all tested our pens on a common sheet. We used variations of a sepia ink. Some were dark brown and some were more reddish. Vincent used different types of ink. Often, he used black ink which has since faded to brown but he also used sepia. I handed out reproductions of some of Vincent’s drawings and we started out by copying them. I wasn’t concerned with perfect copies, by any means, but the process of trying to re-create Vincent’s lines and marks was very instructive. All of us also gained a real appreciation for his genius. We turned our newfound skills to our own imagery in the afternoon. Everyone had brought in photographs of rural subjects. I offered a few thoughts about interpretation of photos, ‘a la Vincent’. Following that, we drew for the rest of the day. The mood in the studio was very positive and the students remarked many times on how much fun it was to draw with a reed pen of their own making. As usual, many were pooped when we gathered for our critique but happy and satisfied. 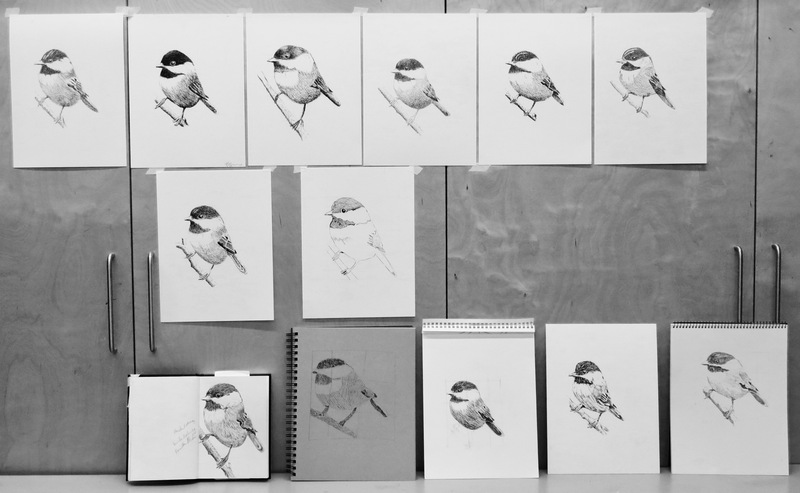 Introduction to Drawing Birds at DVSA! 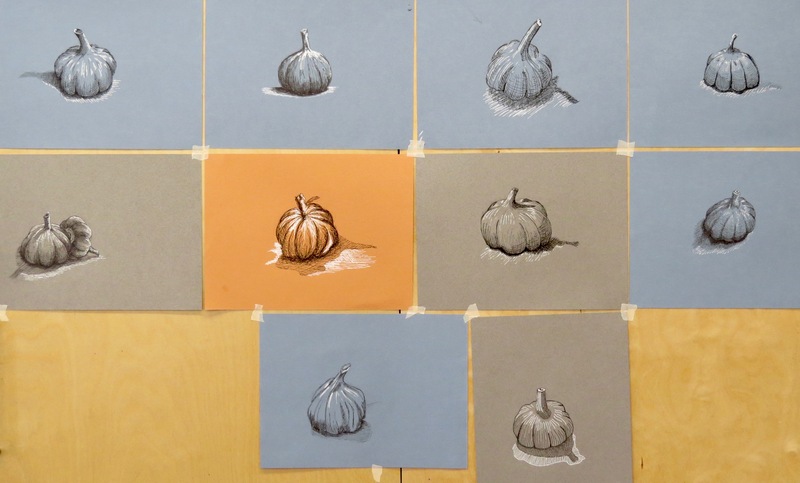 Yesterday, I was back at the Dundas Valley School of Art to teach a one-day workshop. Our medium was pen and ink and our theme was an introduction to drawing birds. I chatted a bit about famous bird artists like John James Audubon, James Fenwick Lansdowne and Robert Bateman and discussed their processes. We also talked about David Sibley and other excellent bird illustrators whose work informs the field guides used to identify birds. Artists past and present have worked from mounted specimens, skins, field sketches and photos. Our only option yesterday was to use photos as our reference. We worked from black and white photos as our drawings were in black and white, as well. Proportion is important when drawing a bird. I used a simple grid approach and presented this to the students. This is a Black-capped Chickadee, a common woodland and feeder bird in southern Ontario. I’m going to show you three steps of my demonstration. 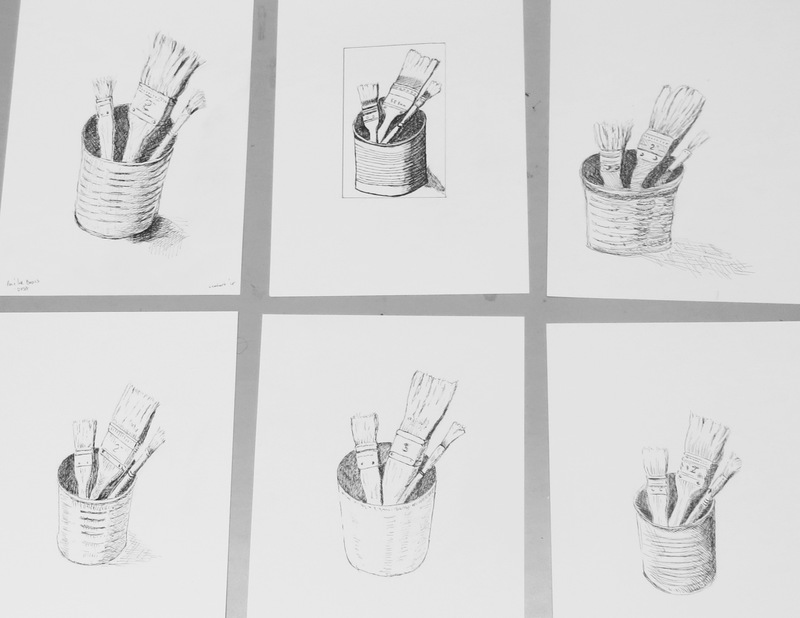 The first step establishes the main values throughout the drawing with hatching. I do not outline and I develop the darks very patiently. Most of the preliminary pencil drawing has been erased, including the grid, but not all. I’ve used cross-hatching to emphasize plumage details and to stress ‘light and shadow’ in order to give the bird fullness and form. I’ve developed the darks and added definition to areas like the undertail and legs. Note the gaps I’ve left around the edge of the bird such as the beak, upper breast, upper back, tail, legs and branch. Did you notice the gaps before I mentioned them? These gaps allow light to flow throughout the drawing and enhance the feeling of vitality. A heavy outline is not only unnecessary; it would flatten out the drawing and detract from the impression of fullness and liveliness. The students followed my steps in order to understand the process. There were a lot of elements to consider and they did very well with the exercise. Our afternoon drawing was a portrait of a Downy Woodpecker; another local favourite. Here’s my grid analysis and my unfinished demonstration. I enjoyed the talented and enthusiastic group of students. Several were birders and many were members of the local Hamilton Naturalists’ Club. They worked hard and came away with a sound process for drawing birds at home from their photos. Let’s have a look at their Downy Woodpeckers. The ‘Dipping Pen’ at DVSA! Yesterday was my first day back at the Dundas Valley School of Art for the fall term. 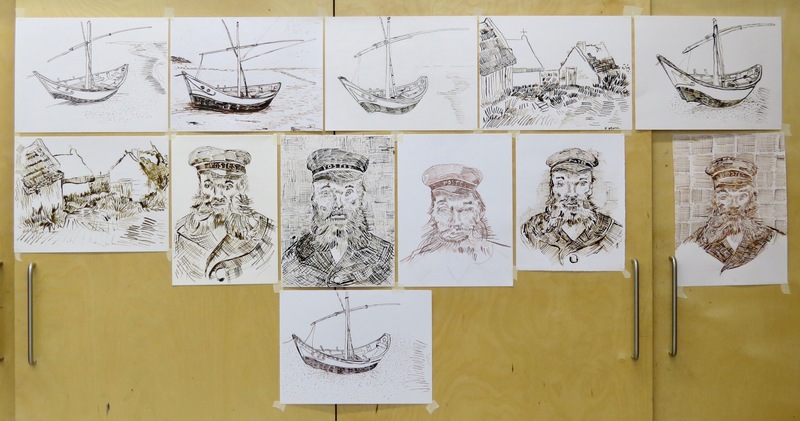 It was a one-day workshop and our theme was pen and ink drawing with the traditional dipping pen. All of my one-day pen and ink workshops to date have employed disposable sketching pens from Pilot, Micron and Staedtler. They’re easy to use; no muss and no fuss. They’re portable and I use them for sketching all the time. However, for my sustained studio drawings, I always use a good old metal nib and a bottle of India ink. I’ve been drawing with these tools since I was a teenager. My all-time favourite ink is Speedball Super Black and I’ve always used their nibs and holders, as well. These are what I recommended on my material list for the workshop. I suggested a choice of three different nibs; 22B Extra Fine, 56 School and 99 Drawing. The paper I recommended was Strathmore Bristol. By the way, Speedball Super Black comes in an extremely practical bottle with a wide (easy for dipping) mouth and a wider (hard to knock over) base. Decades of experience have taught me not just how to draw but how to manage the dipping pen. It’s very easy to make a mess and unfortunate blobs are common for the novice. I started the day with my hard-earned tips regarding the care, transport and use of the metal nib. Everything matters, especially how your work area is organized. The students were given about a half hour to try out their materials, experimenting with marks and strokes and getting a feel for the nibs. Next, I handed out a template of a basic feather shape. 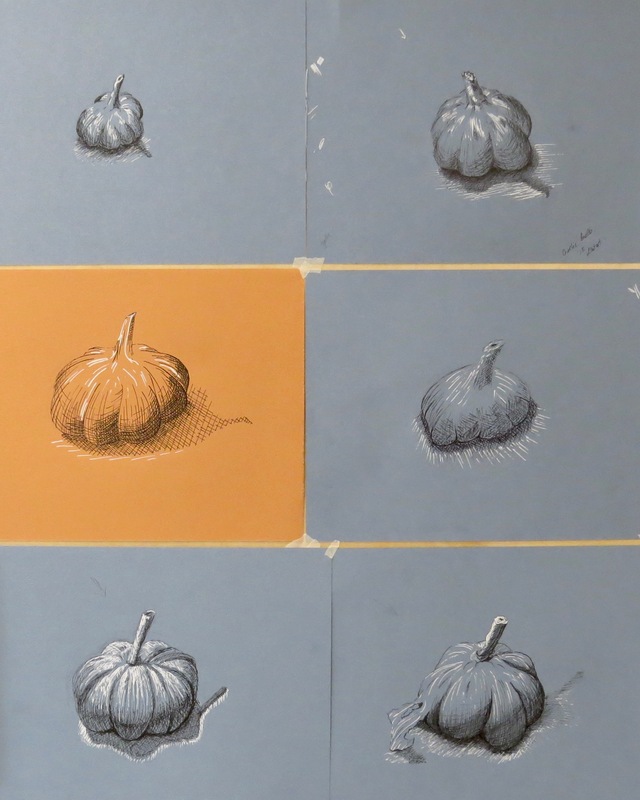 With my demonstration, I discussed mark-making and patterns. It gave the students a chance to unleash their imaginations while practicing with their new tools. They took to it very well. The usual problems were encountered but the only real disaster was a coffee spill! The three recommended nibs were tried by most of the students and the 99 Drawing was considered to be the most difficult to use. It’s very sensitive to pressure and wonderful to work with but may require a little more experience in order to gain confidence with it. Have a look at the feathers. Click on the image for an enlarged version. There’s some lovely detail to enjoy! Our second drawing was of a leaf. I issued handouts with a black and white photo of the leaf. It wasn’t a very good photo, a bit blurry, so we discussed ways to clarify and simplify the image. My demonstration dealt again with technique but also with the concept of ‘light and shadow’. 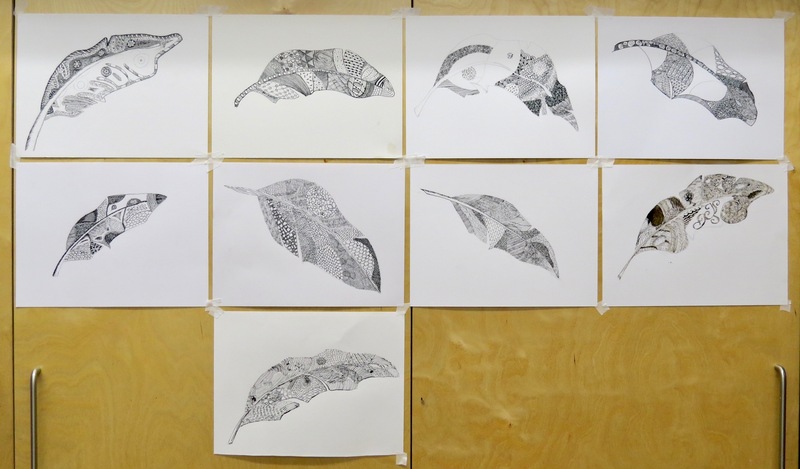 We took our time with the leaf drawings and they were very successful. Overall, it was an enjoyable day with an enthusiastic and talented group of art students. 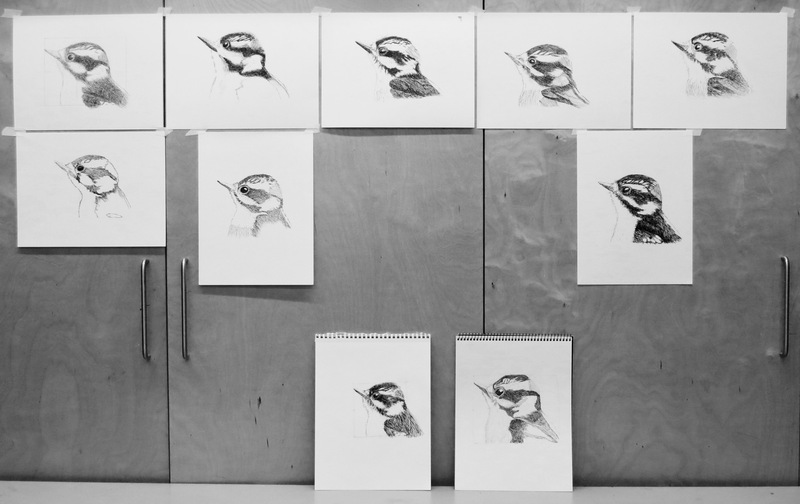 My next one-day workshop at DVSA is an Introduction to Drawing Birds with pen and ink and takes place on Thursday, November 2. Care to join us?